Easter 2013: Was Judas Really That Evil? I used to have a Koran — in fact, I think I still do — on my shelf which was meant specifically for the evangelization of people in Western countries. It displayed English and Arabic text side-by-side from the last page to the first, and the last hundred or so pages were full of apologetic arguments. The only ones I remember were in regard to the Christian Holy Week. How, the Muslim evangelists asked, could Judas have possibly felt malevolent enough to betray Jesus, and then guilty enough to commit suicide ... all in a single weekend? It’s a fair enough question, one that made Mel Gibson resort to a few satani ex machina. But my guess is that the actual reason is much less interesting: most of the imagery with which Judas has been associated is inaccurate. The most accurate portrait of what Judas was like can still be found — in the mirror. Some of the most evil acts in history have been committed by the most banal people, and Judas was probably no exception to this rule. Of course, there isn’t much to go on. You could probably count the number of times that his name is mentioned on your hands and toes. He doesn’t appear to have been a particularly honest group treasurer, but all of the disciples failed at times. When Saint Peter told Jesus that "surely" he would not die in Jerusalem, because he had too important a legacy to fulfill, Judas probably had the exact same thought. Of course, this was the same Peter who, a few days later, would deny that he even knew who Jesus was. Before the rooster crowed, Saint Peter was probably disappointed. 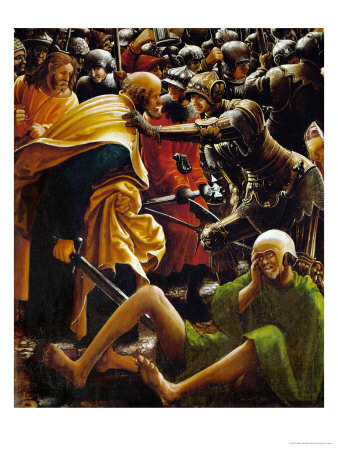 After all, a few hours before, he had cut someone’s ear off in the hopes that it would be the first blow in a revolt that might include all of Judea, with Jesus at the head of it. In a perverse way, that was probably what Judas was hoping for, too. After all, if he could round up a kangaroo court to arrest Jesus, what other alternative would there be than to begin the revolution? Things did not turn out the way that Judas had expected, or, for that matter, like the other apostles had predicted. On Good Friday, they didn’t wait around to lay Jesus’s body in the tomb. That was a task that fell on a wealthy donor and local politician. What the 11 disciples might have been speaking about between the burial and resurrection cannot be known. Some of them probably went to get their old jobs back — they found the fishing nets that they had left behind the house for a few years and maybe caulked the boats whose hulls had become dry and cracked from sitting out in the sun in the time that they had been following the carpenter from Galilee around. Saint Thomas probably didn’t want to be disturbed. He, like Saint Peter, had asked for martyrdom before, but, having been denied this, he probably felt that he should visit his previous contacts and see if any of them needed an architect to bring their houses up to code. The only one who was not doing this was Judas. He had hung himself two days before. It is uncertain how he would have reacted, had he been around on the third day. He was not expecting a messiah resurrected. On the contrary, he had been looking for one who was not going to die in the first place — a first witness to the fact that the world is full of millions of true believers who believe in the wrong cause. The only tomb anyone ever made for Judas was that created by Dante, between Satan’s sable mouth, but, evil as Judas may have been, he was not irregular in his desires, his disappointment, or his end. Having lost hope for a messiah to drive the Romans out, he had no more desire to live, and he did not arise on the third day.